The loss of my friend and companion was made much easier by the professional way Pet Memorial handled all the details. They went far beyond what I expected. Thank you. I have had the sad loss of several of my beloved dogs over the years. Was dealing with a different vet service all those times. However, since switching to a new vet service, I must say how surprised & satisfied I was with the way my little Maltese, Sophia, was memorialized so sweetly so that I can hang the memorials on the wall. Thank you so much for your kindness & sympathy in my loss. On 3/1/2019 I had the pleasure of meeting Patrick Vereb when I picked up the ashes of my dog, Maia. What a compassionate, kind man, that totally understands the love between a family and their pets! I will definitely make a point to request his services to my vet in the future. Thank you!! THANK you again, for the GREAT job you did with Malachi. My daughter loves your presentation and yes, it brought her to tears when she saw it. You do a fabulous job with the fur babies as to many of us they are family members! Again, thank for you for the beautiful presentation. We were more than happy with everything received back along with our Lucky's remains. The framed pawprint and memorial cards were more than we ever expected. Thank you for this wonderful service that you provide. I picked up Bacardi to take him home yesterday. The service you performed and the memorial are spectacular. Thank you so much for the wonderful job. My vet came for a farm visit today for my other goats. I showed her what you did for my Gabby. She took a picture and asked me for information so that they could refer clients. They are Fox Run Equine Center. If you send them information, put "Attention: Dr. Martina". Thank you once again. You made a beautiful memorial for me & Gabby. I wanted to take a moment to thank you for spending the time to talk with me last Thursday about options for my cat. I let him go on Monday at Penn Animal Hospital and decided to have him put to rest on a friend's property. Of the three places that I called considering cremation, you were the only one that was kind and patient when I was confused and scared. That means more than I can express. Thank you so much. Thank you and Ashley for caring and helping me with Charlie. It was greatly appreciated. We got our Penny this evening. I'm so touched by your kindness - it has been a tough year. Thank you so much for all of the beautiful items enclosed in the memorial package. We greatly appreciate everything you did. Every single item means so much. K9 Officer Riggs was loved by so many & he was a true hero. We are very thankful to have such beautiful keepsakes to cherish. We miss him terribly. We are very grateful that Monongahela Animal Hospital recommended your services. Thank you very much for everything! Thank you from the bottom of my heart for being so compassionate with creating such a beautiful memorial package for my Loving best buddy Jake our Pug. My BaBa meant the world to me! We gave Pet Memorial Pittsburgh a photo of my doggie and the picture was framed beautifully and his picture was also put with the" Rainbow Bridge" famous poem which absolutely comforted me during this hard time in grieving process. I also received the paw print and wallet size photos of my doggie. Thank you! We want to thank you for taking such good care of our "baby" Allie. She was our first pet we have ever had to send to the Rainbow Bridge (at almost 17 years). We appreciate the paw print memorial more than words can say. Thank you again and know that when the time comes for our other paw babies, we will certainly choose your services. I want to thank you for your service in taking care of Sweetpea. Also, thank you for making her paw print, that means so much to us. It seems so lonely without her, but she is in a better place, no more pain. Again, thank you. The Staus family. When I received the ashes of my wonderful cat, Luther, I was so impressed! What a beautiful display. I cannot say enough about the quality and detail of your services. With many thanks and appreciation for your wonderful services. I will be using your business in the future. Patrick Vereb, Thank you for being so helpful and understanding in our time of grieving over our loved Bunnicula. I want to express my sincere thanks for your compassion and the wonderful job you did with my memorial to Cody. God bless you all. With warm appreciation for all you've given of your time, your energy, and yourself. Thank you for caring for our dog Patches. Greatly appreciated. Thank you for taking such great care of our girl. We love it! We are so happy to have her home. Just received the cremation memorial for Tina. We could not be more happy. You did a superb service. Thanks again. 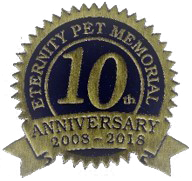 To all at Eternity Pet Memorial, We wanted to thank you for the wonderful details and care you treated our Max with. A special thank you to Michael, you were extremely comforting and put both our minds and hearts at ease. Another thank you to Patrick for bringing him back home. We are so grateful Doc & Shari from Ambridge Area Vet Clinic gave us your number. You provide an amazing service, far beyond anything we ever could have expected. From the bottom of our hearts, Thank you. Thank you for a wonderful service and your wife for her time. Hello, I just wanted to write a note about how extremely pleased I am with your service. From the moment you came to my house, I could tell you really went the extra step to make a bad situation easier to handle. As you know, losing a pet is so very difficult, whether it is sudden or expected. I am so happy with the memorial items you provided for my beloved husky, Meisha. I've never had anything so thoughtful in that regard. Your service goes the extra mile to make everything special. Thank you with all of my heart. Sincerely, Lisa Sutterlin, Meisha's mom. Mr. Vereb, Just a note to let you know how much we appreciate the professional, courteous and friendly services you provided for our Cassie. When you said "I'll take good care of Cassie," you gave us a sense of peace. We still miss her, but it helps to still have her close. Everything you promised was fulfilled above and beyond. Thank you again, David and Christine K.